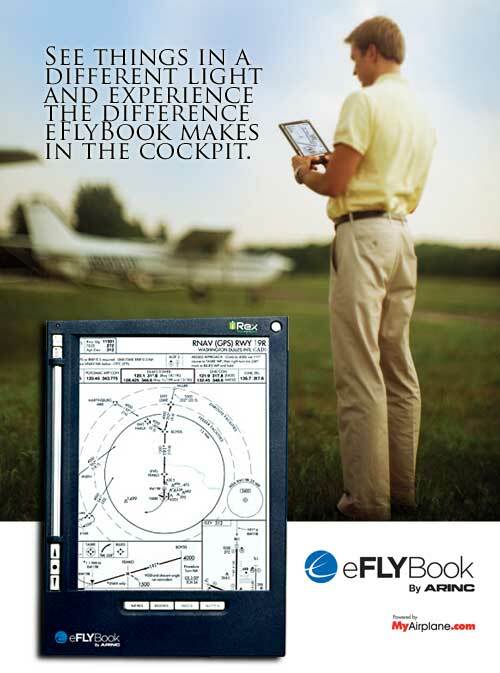 e-Ink, for pilots, oh yeah, and it’s real! You’re probably been reading about e-Ink concepts that are out there (here and here for example). These, like the many before them, treat e-Ink as a conceptual anomaly that may one day be cool. Well, it has been here for a bit, in useful practice. 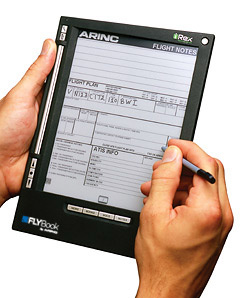 The people at ARINC developed the eFLYBOOK and it is available for pilots the world over. It is an e-Ink viewer for use in aircraft, mainly for pilots. This is an entirely interactive tablet (hmmm, you Tablet PC (and Mac) folks paying attention,, maybe the back of a regular laptop screen maybe?) that stores, maps, charts, and forms for pilots to fill out. It does it all with a material that reads like ink on paper (yes, hence e-Ink). Stylus interactivity of course as well. The thing about the e-Ink is that the contrast ratio is like that of type on a regular book, no matter the angle, no matter the light, the contrast is the same (ok, at night it’s hard, but the same goes when reading a book, plus this can be backlit). The silly thing, is it came out in July of last year. So while people scramble to be first to the e-Ink game. Here’s an industry leader that has a functional device that provides real value. Go get one for $1499.00 USD at Aircraft Spruce. can’t wait to become one of them.. and from my experience so far i can tell that this is indeed a great, great device… much better than wasting time with looking for charts and data, and for writing stuff while in-flight… also it saves a lot of useless carrying around of heavy folders.. the only thing that would make this cooler would be the possibility to connect it to a GPS-mouse and let it display various positional data, maybe even an outline map.